According to Zillow, the total value of all homes in the United States in early January 2018 is now $31.8 trillion after gaining $2 trillion in 2017. The cumulative value of the U.S. housing market grew at its fastest annual pace – 6.5 percent – in four years. The value of all U.S. homes rose 8 percent annually in the early stages of the housing recovery in 2013. Total U.S. housing market gained $2 trillion in value in 2017. The value of all U.S. homes grew 6.5 percent in 2017, the fastest pace in four years. 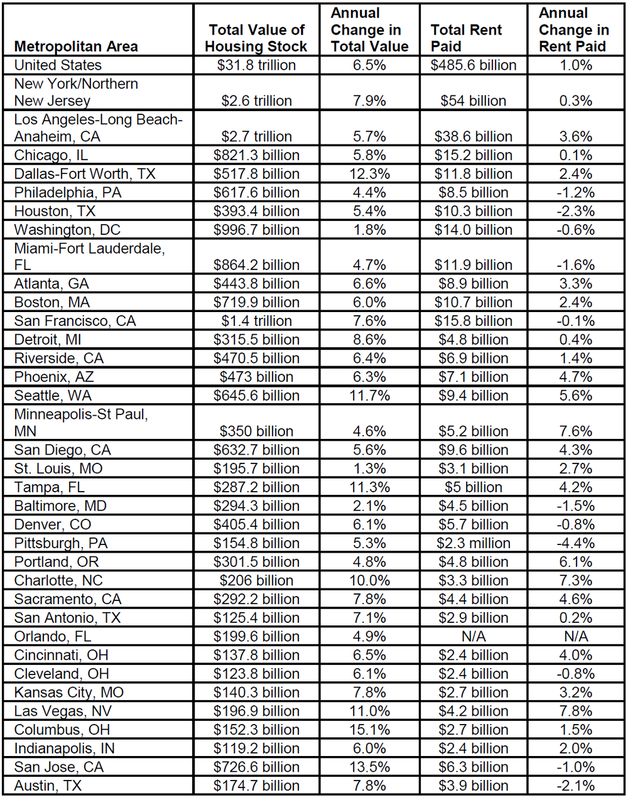 Los Angeles, New York and San Francisco are the most valuable housing markets, each worth more than $1 trillion. For many households, a home is the single largest source of wealth, but the collapse of the housing market and the ensuing Great Recession demonstrated the importance of housing to the U.S. economy as well. The housing market has gained $9 trillion since the lowest levels of the recession. The value gained in 2017 alone is equivalent to more than the valuation of two companies the size of Apple. Over the past year, the U.S. housing market has gained $1.95 trillion, while Apple recently hit a market value of $900 billion, the first U.S. company to do so. The Los Angeles and New York markets each account for more than 8 percent of the value of all U.S. housing, and are worth $2.7 trillion and $2.6 trillion, respectively. San Francisco is the only other housing market worth more than $1 trillion. Among the 35 largest U.S. markets, Columbus grew the most in 2017, gaining 15.1 percent. San Jose, Dallas, Seattle, Tampa, Las Vegas and Charlotte, N.C. also grew by 10 percent or more over the past year. Renters spent a record $485.6 billion in 2017, an increase of $4.9 billion from 2016. Renters in New York and Los Angeles spent the most on rent over the past year. These markets are also home to the largest number of renter households. San Francisco rents are so high that renters collectively paid $616 million more in rent than Chicago renters did, despite there being 467,000 fewer renters in San Francisco than in Chicago. Las Vegas, Minneapolis and Charlotte, N.C. had the largest gains in the total amount of rent paid, with each increasing by more than 7 percent since 2016.